I normally try to cook my meals from scratch most of the time but I have seen recipes for Mississippi Pot Roast online for years and I finally decided to give it a try. Most all of the recipes I’ve seen are the same: chuck roast, butter, ranch seasoning, au jus gravy mix, water, and pepperocinis all thrown together in a slow cooker for several hours. How simple is that? Instead of using a slow cooker, I did a light sear on the chuck roast then tossed everything together in my Dutch oven and cooked it low and slow in the oven for four hours. The meat was tender, spicy, and so flavorful! I served this shredded Mississippi pot roast in hoagies with melted Havarti and sliced tomatoes then we dipped them in some extra au jus that I served on the side. 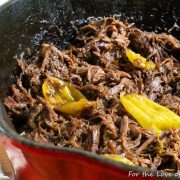 We all, kids included, thought this pot roast was amazing. My husband came home for lunch today and we devoured the leftovers. 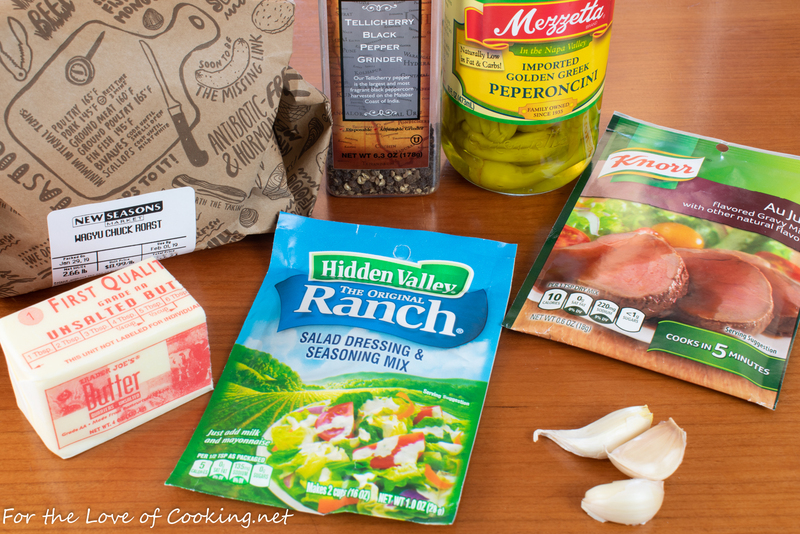 If you are still looking for meal ideas – this Mississippi pot roast would be perfect for Super Bowl Sunday! 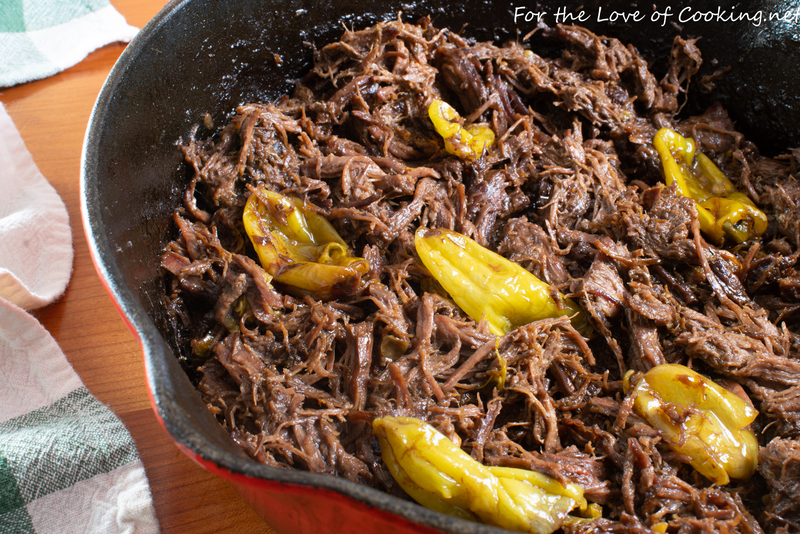 Season the entire chuck roast with freshly cracked black pepper, to taste. Heat 1 tablespoon of butter in a large Dutch oven over medium high heat. Add the roast and lightly sear on all sides, about 3 minutes. Remove from the heat. Add 1/2 cup water to the Dutch oven then sprinkle in the ranch seasoning and au jus packet seasoning. Add the remaining five tablespoons of butter around the roast. Place the pepperocinis and sliced garlic around the roast. Cover with tight fitting lid and place into the oven to slowly bake for 4 hours, flipping the roast halfway through cooking, until the meat is tender and falling apart. Remove from the oven allow to cool for a bit. Remove any bits of fat then shred the meat with two forks. Serve. Enjoy! Season the entire chuck roast with freshly cracked black pepper, to taste. Heat 1 tablespoon of butter in a large Dutch oven over medium high heat. Add the roast and lightly sear on all sides, about 3 minutes. Remove from the heat. Add 1/2 cup water to the Dutch oven then sprinkle in the ranch seasoning and au jus packet seasoning. Add the remaining five tablespoons of butter around the roast. Place the pepperoncini peppers and sliced garlic around the roast. Cover with tight fitting lid and place into the oven to slowly bake for 4 hours, flipping the roast halfway through cooking, until the meat is tender and falling apart. My mouth is watering 🙂 Looks hearty and so good! Honestly, this is fabulous! The meat is tender and flavorful. I shredded the meat and put it on a hoagie roll with Havarti cheese and I believe I could eat a few more!! My husband will love these. 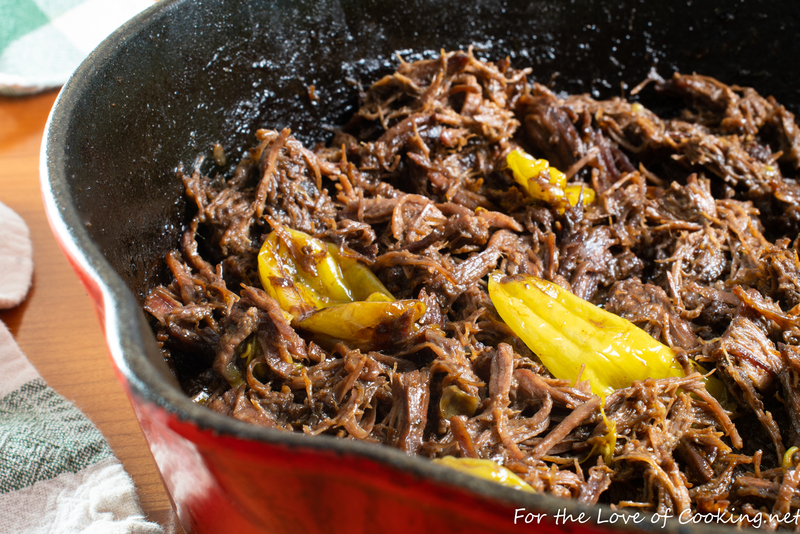 I cooked the roast exactly as per your directions and I think using a Dutch oven instead of a crockpot or Instant pot made all the difference as there is such a depth of flavor. I will make this again and again. Thank you!